Home / Application Case Studies / Redsun – Taste the warmth! Redsun – Taste the warmth! 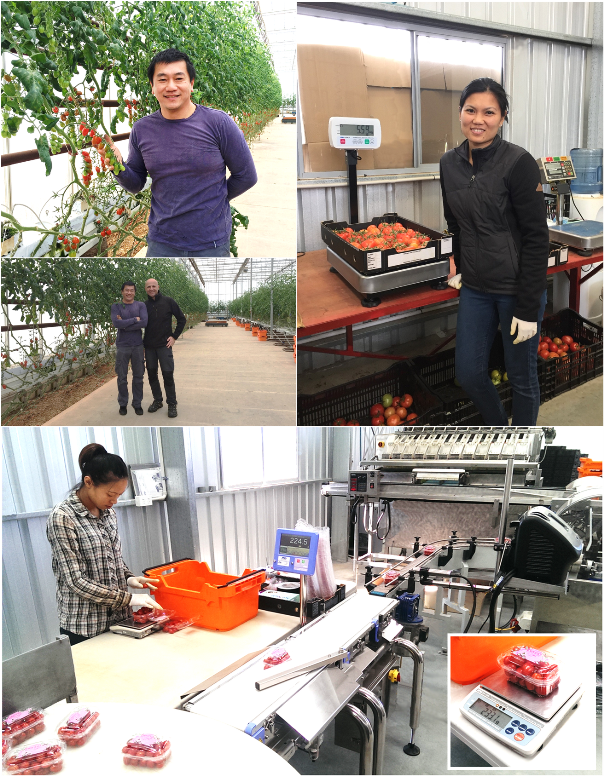 When you taste the beautiful sweet tomatoes that Phuong & Van Le grow at their family farm 40km north of Adelaide, you can tell they put their heart & soul into what they do. Sweet, bright & bursting with flavour, their advanced glasshouse facility produces some of the best tomatoes you will ever taste and it’s no surprise they have been on our supermarket shelves for several years. Phuong is a natural green-thumb and when he’s not focussing on their commercial crops, he’s keenly nurturing his hobby plants in the form of Asian family favourites like Bitter Melon & Custard Apple. Running a major glasshouse facility is a massive task, especially with a young family. Phuong & Van know that having the right processing & measuring systems in place is paramount to success. Three years ago when they were undertaking a rapid expansion, Phuong was one of the first people in Australia to invest in A&D’s EZICheck™ inline weighing system and it has served them well; automatically checking and recording hundreds of thousands of punnets, ensuring only optimal weights leave the premises. When it comes to weighing equipment there is a lot of choice out there and Phuong sums it up when he says “we don’t buy scales, we invest in peace of mind and A&D delivers just that”. Reliability is a given with any Japanese equipment but with A&D it’s the combination of simple, efficient & reliable technology with local advice & backup whenever you need it. In that short three years since, A&D have now installed over 150 EZICheck™ checkweighing & metal detection systems across Australia into companies both large & small. If you’d like to see one of these systems first hand then get in touch with your local A&D office or Authorised Partner. A system can be brought straight to your site for an in-depth test & analysis.